If you have ever had the misfortune of being in a rear-end car collision (hopefully you haven’t and never will be), there is a good chance you may have experienced a painful, potentially dangerous phenomenon known as whiplash. Whiplash is far less common today than it was years ago, before many safety features were added to automobiles, most notably the headrest. Picture this...you are seated in the front seat of a fire engine red with white interior 1957 Chevy Bel Air. (The ‘57 Chevy was a beautiful car but was equipped with neither safety belts nor headrests). You are stopped at a red light just before the drive-in movie theater. All of a sudden, a 1954 Thunderbird traveling 20 mph slams into the back of your car. What happens to you? Well, first of all, your body is at rest and it will therefore stay at rest until acted upon by an outside force. All of a sudden, here comes that outside force courtesy of the ‘54 Thunderbird. The Thunderbird shoves your car, including the seat on which you are sitting, forward. Since your legs, bottom and back are resting against the seat, they are accelerated forward as well, but, what about your head? Your head is not resting against anything and is therefore not subjected, immediately, to an outside force. So while the rest of your body is accelerating forward, your head remains at rest. A split second later, your head is pulled forward by your now hyper-extended neck, kind of like the tip of a whip as the whip is cracked. Hence the term, “whiplash”. Newer cars are now required to have headrests to help prevent whiplash and its debilitating effects. These do no good, however, unless the headrest is properly adjusted. 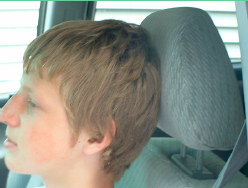 Especially if you are particularly tall, you should always adjust the headrest so that it is positioned right behind your head (not at the base of your neck) while riding in a car. Are seat belts really needed, even if you are going slowly? The answer is a simple and very emphatic, “YES!” Seatbelts save lives. Picture yourself traveling in a car that is going 35 mph. Relative to you, everything in the car is going 0 mph. Nothing looks dangerous. The other cars, trees and telephone poles don’t look like they are going too fast past you. If the car gets in a collision it will stop very quickly. This change in motion is caused by an outside, unbalanced force applied to the front end. It might be a telephone pole or another car coming the other way. So the car’s speed changes from 35 to zero in a very short time. If you have your seatbelt on, your speed also changes that quickly. Instead of the telephone pole slowing you down, it’s the seatbelt that applies the outside, unbalanced force to you. It may be uncomfortable, but it protects you. would feel if you caught an 80 lb. sack of cement falling from a rooftop!